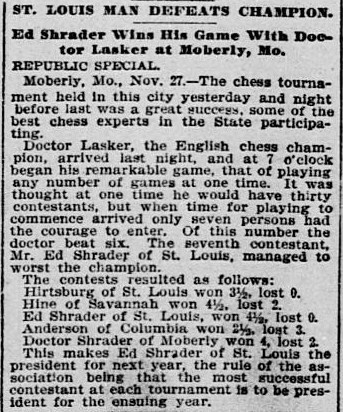 Since my last post on the Quincy Telegraph chess matches, some additional information has come to light on the Quincy - Chicago match , along with the first game of that match, in the chess column of the Chicago Tribune. It was thanks to the web site Chess Archaeology ,that I found this particular chess column. 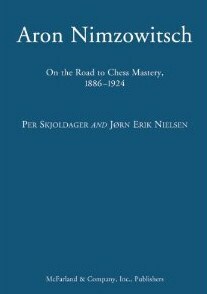 Chess Archaeology is an invaluable resource for those interested in chess history. What makes the matches of the Quincy Chess Club of more than usual interest is that on the Quincy Chess Club team was Ernest Morphy, the uncle of Paul Morphy. Ernest Morphy had moved to Quincy Illinois after living two years in Ohio, previously Ernest Morphy had left New Orleans in 1854 for Ohio. For more info on Ernest Morphy along with some games follow this link . "...a match was played between the Chess Clubs of this city [Chicago] and Quincy by telegraph, the result telling in favor of the latter. As if to console Chicago for her defeat about the same time Fond du Lac 'laid out' Milwaukee, indicating that enthusiasm and skill in this noble game are by no means metropolitan . The return match between Chicago and Quincy was played on Friday night....It was pronounced a much better game than it's predecessor , evincing more deliberate skill and study. The game is as follows Chicago (white) winning handsomely , Quincy resigning at the 28th move"
Louis Paulsen, according to the Chicago Tribune had agreed to play a two game telegraph match against the Quincy Chess Club.
" 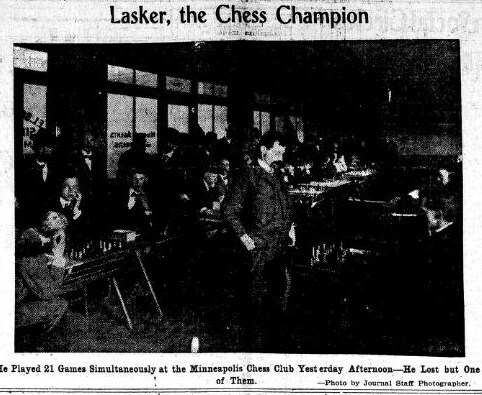 ...Louis Paulsen will some time in the next two weeks, play a match single handed with the Quincy Chess Club"
"On Tuesday evening Mr. Paulsen, the great Dubuque chess player-(who is distinguished, especially, for his success playing a large of games simultaneously , without seeing the board)-is to commence a match of two games with the Quincy Chess Club,on the same terms ( as to time [ten minutes per move]) as the recent match. On Thursday Mr. [Ernest] Morphy, of the Quincy Club, plays a game with Mr. Kennicott, of the Chicago Club- and at the same time a game is to come off between two members of the Chicago Club and two of the Quincy Club." " The chess match between Louis Paulsen... and the combined forces of the Quincy Chess Club, commenced on Tuesday evening at 8 o'clock.Mr. Paulsen playing white, having the first move, chose the favorite opening known as Evan's Gambit. Ten minutes was the time allotted for each move. The game lasted only two hours, the Quincy Club resigning on the 18th move. The players on part of the Quincy Club were Messrs. E. Morphy, Alexander Pearson, John Tillson, J. G. Martin. and G. Rowland." " The games by wire between Chicago and Quincy resulted Chicago 1, Quincy 1 . In addition to this match Mr. Paulsen has conducted two games, single-handed, against the Quincy club, and was victorious in both instances." Under the heading; The thirteenth move was unlucky from Chicago Tribune January 7, 1900 comes this curiosity.
" The following short game was played during the week at Mr. Lee's home. The first move was made by Sidney P. Johnston, the first move for black was made by Frank J. Marshall. Then James W. Taylor made the second move for white and Harry F. Lee for black. Thereafter each player moved in his regular turn without consultation with his partner."